Denning Drive in Winter Park could lose one or two traffic lanes and gain a bike path. 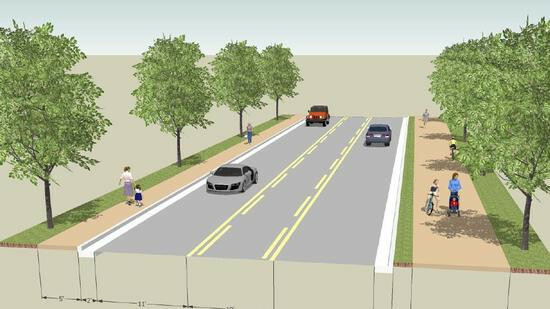 At its meeting Monday, the Winter Park Community Redevelopment Agency approved $500,000 in funding for a project that would turn the four-lane road between Webster and Fairbanks avenues into a road with two lanes. In between would be either a center turning lane or a median with separated left turn lanes. Meanwhile, a designated bike and pedestrian pathway would run down the side of the street, with a pedestrian walkway on the other side. Trees would also be included along both sides. An analysis by an engineering firm showed that with a daily vehicle count of about 7,500 a day, Denning is a good candidate for undergoing a lane reduction without any major effects. Waits at the signals at Webster and Canton avenues would mostly be unaffected, while the biggest change – during the evening rush hour – would be an extra 4 seconds of delay at the Morse intersection. The funding was approved as part of the the Community Redevelopment Agency’s total budget, which would need to be approved by the city commission as part of the overall city budget. There would be no separate public hearing on the Denning project. Any change in the funding would need to be re-approved by the CRA, which consists of the commission plus one member representing Orange County.